Head on over to Abyquilt for a wonderful giveaway. May Britt's blog is two years old and she is celebrating by giving away some lovely prizes. Raining, windy and cold today around 8 degrees C. Nice to sit by the fire and get some stitching done. Am sewing my 'Kookaburra Christmas ' stitchery, it will be a sample. It is a very popular pattern (everyone is starting their christmas stitching already). This butcherbird was sheltering on the washing line and trying to keep dry. Mmmm a nice toasty fire. I think I'll make a cuppa and warm up a bit (my computer is in another room). The lovely Rosemary from Stitch In Time is featuring one of my stitchery patterns - 'Footy Roo' at her stall (C21) at the Craft & Quilt fair at the Melbourne Exhibition Centre, so do call in and see her if you are going to the fair. Still busy stitching out stitchery samples for my shop customers. I will find time soon to work on new designs (I hope). Hubby and I visited the Farm Fantastic Expo (at Cabooolture) on Saturday. Saw lots of interesting farm stuff. Don't know what this one is, but it looks a bit menacing. Maybe it picks up logs? Here is Ned the llama. He was lovely and soft. (and had funny bucked teeth) - he was a sweetie. If we had more land I would like some of these. They had camel rides too - very popular! Our winter evenings are getting a little chilly here in sub-tropical Queensland. So Dash now has a new warm red coat. I think that the red looks good on her. Whilst I was taking her photo, she didn't want to look at the camera, until I said ' do you want a treat?' snap! Dogs always listen when you mention food....funny that. We went to the Medieval Festival (near Caboolture) on Saturday. Had a great time. Saw lots of interesting displays and demonstrations - fencing, jousting, dancing, cooking. The costumes were amazing. Arrr... perhaps an early pirate flag? Our resident Satin Bower bird has built a new bower just over our back fence. He has collected lots of blue things to decorate it with. Every day he re-arranges the decorations to look just right (to attract the ladies). 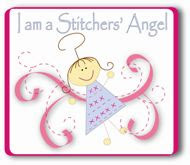 Head on over to Hugs from Helen for Helen's new "Stitchers' Angel Swap". Join in the swap, and you will be allocated a secret stitcher. Beginning on the 18th August, participants will be able to print seven free patterns, one each week. Then, over the seven weeks, make three of the projects to surprise your stitcher with. We will be making sewing accessories. Come with me for a quick tour of our *(newly aquired) railway carriage. Centre of carriage: Here we have a little fold-down table and some built-in bookshelves (I'm sure I won't have any trouble filling them up) We are thinking we might take out the doorway (in the background) to make the room bigger. This leads through to the unrestored end - lots of work to do! The curtain is only temporary. Here is the little sink and cupboards in the centre of the carriage. We might take out the wood panel (thin wood screen) behind the shelves. End wall of the restored part of the carriage. You can open up the louvre window and let in the breeze. The timber is red cedar panelling. The floors (skinny tongue and groove) are awaiting to be sanded. We were told that the wood is a nice dark red colour when sanded back. We need to place some skirting boards around after the floors are finished. Here is the sliding door that leads into the restored end of the carriage. It has nice glass panels. (old). I can't wait till we transport it to its new home in our front yard. It will be wonderful to have a proper workspace/studio. I will just have to be patient. The gorgeous Suzanne from Country Quilt Co is now stocking my patterns. 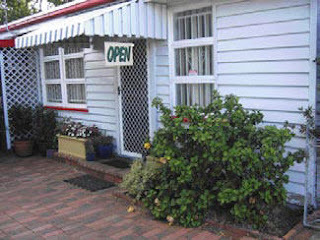 Her lovely shop (previously the old Post Office) is located in North Ipswich, on 2 Pine Mountain Road. The Country Quilt Co is participating in the annual 'Shop Hop' where shoppers can visit 11 patchwork and needlecraft stores from Brisbane to the Gold Coast during July. The theme this year is 'Christmas in July'. (Suzanne will feature my 'Kookaburra Christmas' pattern) Each person has a Shop Hop 'Passport' to stamp as they visit each store. Shoppers will be in for a treat at Suzanne's store, with tea and coffee and yummy delights being offered. Sounds like lots of fun as there are great prizes to be won 'shop hopping'. (not to mention the opportunity to buy fabulous fabric, patterns, goodies etc) I'm sure everyone will have a fantastic day out!